When we last left the warring factions of my sports fan brain, PD (Pessimistic Dan) was being beaten back from the brink of victory. The Jays 11 game winning streak had given RD (Regular Dan) some real hope; a light in the darkness. The rotation was better! Reyes was back! Kawasaki was… Kawasaki! Since then, things haven’t been so rosy. Pessimistic Dan: Hey buddy. Buddy! Regular Dan: I’m not your buddy. PD: Well fine. Hey other half of my cerebrum. RD: You’re right, that doesn’t sound as good. PD: It sounds about as terrible as the Jays have been in July! RD: Man. You just never stop. Give me a break! PD: Like what? The Jays 10-16 record in July? Or the fact that they’re now 14 games behind the division leading Rays and 9.5 games out of the second Wild Card? RD: Brett Lawrie just needs to hit a little better! PD: Yes, yes (soothingly). How about I go through the Jays piece by piece and give them my own personal report card grades, and you can chime in whenever you feel like you see something positive? RD: Oh sweet fancy Moses. Fine. I guess they’ve earned it. RD: Wait, are you actually being nice? PD: —a trend that was the biggest knock on Reyes coming into the season. 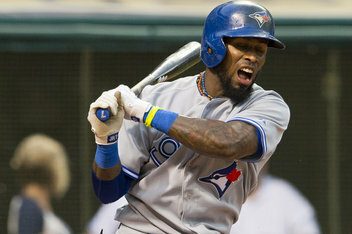 As it stands he’ll play less than 100 games in his debut season with the Blue Jays. That said, I’m not going to kill him for a freak slide into second base. Having Reyes in the lineup is undoubtedly an asset. He gets a ‘B’. RD: A ‘B’? Wow. A realistic grade! And you said all the nice things I wanted to say! PD: Hey man, I’m not a villain. Just a pessimist. Also, just wait. 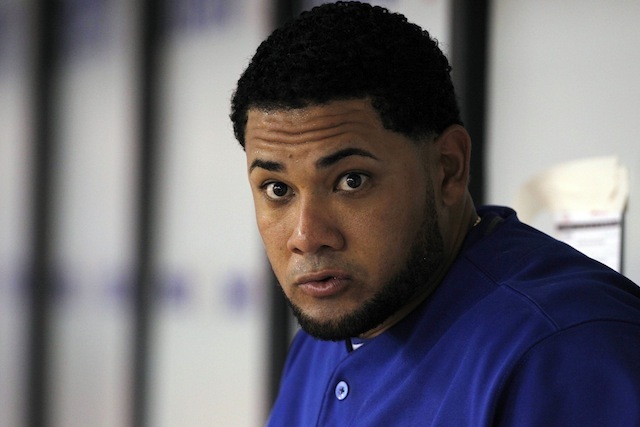 PD: Moving on, we come to left fielder Melky Cabrera. I can already tell you that his grade is an ‘L’. RD: An ‘L’? What kind of grade is that? PD: Let me just do a little breakdown for you. RD: Who are these guys? PD: Well Player B is Melky Cabrera this season, if he plays in every game until the end of the year, something that looks increasingly unlikely. Player A is Melky Cabrera in 2010. That year he was so abysmal that he was cut at seasons end by the Atlanta Braves and made into a free agent. He then went on a two season (nearly) tear with the Kansas City Royals and San Francisco Giants, at the end of which he was busted for taking performance enhancing drugs and suspended for 50 games. So as you can see, Melky has basically regressed back to his pre-PED form, meaning he’s a worthless scrub that we’re paying 8 million dollars this season and next. PD: In case you were wondering, the ‘L’ stands for ‘Liar’. PD: Moving on! Jose Bautista is back in his third spot in the lineup, after a stretch where he hit second, and is entrenched in right field. He’s provided his usual generous power so far this season and he’s still walking, though his .302 batting average from 2011 seems to have been an outlier. Regardless, he’s been a force in the middle of the lineup and his arm still plays well in the field. He gets a ‘U’. RD: A ‘U’? What the hell is a ‘U’? I should have known you’d make a mockery of this whole thing! PD: It stands for ‘U gotta calm down, dude!’ Bautista hasn’t done himself any favours this season, getting tossed out of multiple contests for arguing balls and strikes and fostering a reputation as a whiner across the league. As always, he’s blunt and well-spoken in his thoughts on the matter, but it doesn’t matter if you’re not getting calls because the umpires think you’re a prick. RD: Yes, that has been rather annoying to watch. PD: You know it! Next comes Edwin Encarnacion, and what grade could we give EE, other than an ‘E’! RD: An ‘E’? That’s a failing grade! That’s what my old grade 5 teacher used to give instead of ‘F’s’ because he didn’t understand why you’d jump from D to F, which kind of makes sense now that I think about it Mr. Romain! PD: Oh it’s not a failing grade here. E in this case stands for excellent. Edwin has easily been the Jays best player this season. He’s blasted away any worries I had about regression with his hot and timely hitting. His K rate is remarkably low for a power hitter and he’s even moved back over to third base for some games and acquitted himself nicely. With Brett Lawrie back, that experiment is mostly over, but it was nice to see him exorcise some of those old ‘E5’ demons. He’s on pace for his second consecutive 42 homer season and it’s a pleasure to watch him play every day. RD: Well, yes, I couldn’t have said it better! PD: I know! I’m not really giving you much time to talk here am I? RD: You’re being downright reasonable! It’s hard for me to chime in! PD: I’m sure you’ll want to spring to someone’s defense sooner or later. With that in mind, let’s move to everyone’s favourite lightning rod, catcher JP Arencibia! RD: OK now, you just take it easy on JP. PD: Last month, you yourself called his defense atrocious! PD: Well yes, I thought that was rather ill-timed, considering that his July batting line of .232/.284/.333 line was actually an improvement from June, when he hit just .175/.230/.313. The guy is not only terrible behind the plate, he’s bad at the one thing he’s supposed to be good at. Just 2 home runs in July! Only 9 in three months since he hit 8 in April! JP gets a ‘J’ for joke. RD: A ‘J’? What kind of grading system are you using anyway? PD: My own! It has merit. You’ll see. RD: I’m afraid that I eventually will. PD: Next up is someone I’ll let you talk about. I’m giving him an ‘A’. RD: It has to be! PD: That’s right. Rajai Davis. RD: Awesome! Thanks man! Rajai has been fantastic so far, to the tune of 31 stolen bases this season. He’s actually accomplished that despite having only 190 total at bats. The steals themselves actually on took place during just 22 total games, as Rajai has several multiple steal games, including 4 in a game against Houston last week. The Jays are 11-11 in games where Davis steals a base successfully, which actually represents an improvement on their overall winning percentage. His 31 steals rank third in the major leagues behind Jacoby Ellsbury of Boston and Everth Cabrera (soon to be suspended for Biogenesis) in San Diego. My point is that the guy has been a perfect fourth outfielder. He filled in admirably when Melky was injured and he seems to make something happen every time he comes into a game. He totally deserves this ‘A’. RD: Yeah! Gotta love some Rajai! PD: Well hold onto your hat. Next up is our Canadian content, third baseman Brett Lawrie. Lawrie has struggled with injuries again this season, missing time at the beginning of the year and then again after an aggressive slide into second base injured his ankle. He’s been slow to get the bat going, hitting just .209/.277/.387 on the season. RD: The numbers haven’t come around at the plate yet, but he’s looked more comfortable the last couple of weeks. He’s starting to hit for more power. And let’s not forget that defense at third base. PD: Yeah fair enough. I’m still giving him a ‘Y’. RD: Man, you already did that whole ‘use a letter as a word’ crap with Bautista. It’s getting tired. PD: It’s not tired if it works! Burned you again! PD: And loving it! 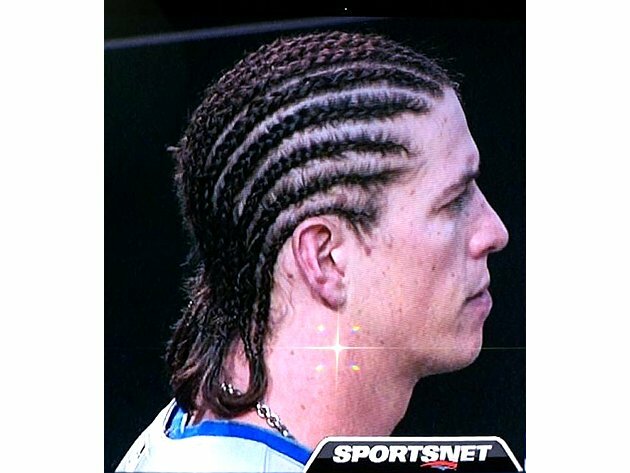 Let’s move on to Colby Rasmus, who has been one of the most interesting Jays this season. I’m giving him an ‘S’. RD: I suppose that’s for… uh… wait, that doesn’t work with your crappy format. RD: Oh I remember. The guy chases more curves than George Clooney! Hey-o! PD: —and he proceeded to follow it up with the best offensive month of his career. He hit .371/.413/.588 for an OPS of 1.001, hit 3 homers and drove in 17 runs, including a game winning walk off single against the Houston Astros last Sunday. Colby has been raking! RD: So why sneaky then? PD: Because he’s secretly fallen off on the defensive end. While he still makes most of the plays in centre, anyone watching the Jays regularly this season has noticed Colby making myriad ‘oopsy-daisy’ mistakes – balls bouncing over his head, misplaying liners – things that he never normally did before. PD: I told you so. RD: But the numbers don’t bear out your assessment. Colby’s fielding percentage sits at .985, which is actually above his career mark of .981 and he’s only made 4 errors on the season, which puts him on pace for 6, which is about normal for his career. He’s actually got a career high UZR rating of 14.3, the advanced stat that takes into account the difficulty of the plays he’s made and how much range he’s covered. PD: I don’t care. He’s been making boneheaded plays! You don’t get errors for every stupid mistake. He’s looked lost out there at times, which was never the case before. He gets an ‘S’ for sneaky because it’s clever and a clever crowd will appreciate it! So there! RD: Ok man, ‘S’ it is. I’m giving you an ‘S’, for settle down! PD: I’m giving you an ‘S’ for shut up! RD: This is getting out of hand. Rasmus’ season could be going worse, I suppose. PD: Let’s check out our next grade. You know what? They get an ‘S’ too! PD: That’s right, they! Maicer Izturis and Emilio Bonifacio were supposed to be super-subs, while splitting time at 2nd base. RD: So the ‘S’ is for Super-sub? RD: I see. I suppose I had that coming. PD: So did they! Both Izturis and Bonifacio have been disappointments. Bonifacio hasn’t been able to get on base consistently enough to use his one elite weapon, which is his blazing speed, and has been a general travesty in the field. Izturis has been solid with the glove but has hit just (.251/.300/.323). The Jays even experimented with moving Brett Lawrie back over to second base, just to keep these two plugs riding the pine pony express. RD: I have nothing positive to say. These guys were supposed to be super-glue. Instead, they’re more like that crappy school glue that you get that kind of sticks, but doesn’t, and then everything falls off your Samuel de Champlain project in grade 6. PD: Wow, we got a pretty deep look inside you there didn’t we? RD: It’s inside you too! We’re the same person! You’re just polluting me! PD: I have to say, it’s been quite enjoyable this month. Let’s finish up the batting order by talking about Adam Lind. Like Jose Bautista, I’m giving Lind a ‘U’. PD: Nope! This time it stands for ‘unsustainable’. RD: He’s been much better this year! PD: That’s only because he was so terrible every year since 2009! Everyone is overlooking that he’s in the middle of a lineup that’s 7th in the Majors in runs scored, he’s primarily the designated hitter and he’s only got 12 home runs and 39 RBI’s. It’s August 1st! That’s not good enough. RD: Are we almost done? This is excruciating. PD: Getting there! We still have to talk about some pitching though. RD: Oh, can’t we just skip it? F’s all around! You’ve broken me. PD: No, we can’t skip it. Besides, there are some guys who don’t get F’s. PD: Yeah! I’m giving the bullpen a ‘C’! 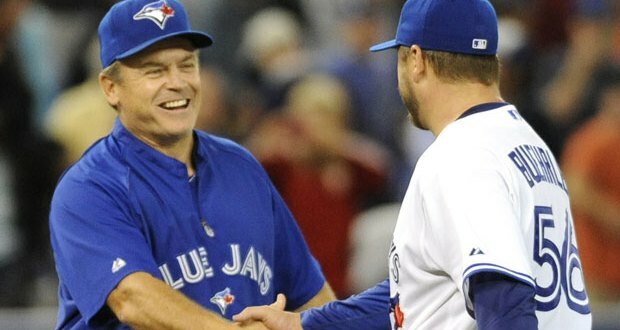 Steve Delabar and Brett Cecil made All-Star appearances this season, they have to get some credit. Cecil has had a tough second half so far, but like the rest of the bullpen, that can be attributed to his being used so heavily during April and May. His season numbers are still fantastic. Delabar has continued to be lights out, with the Jays second nine pitch, nine strike, three strikeout inning of the season the other day, joining Cecil in that club. Casey Janssen has continued to excel in the closer role, always ready and throwing strikes. The ‘pen falls off a little bit with Darren Oliver, who’s starting to show his age and has posted his worst ERA in five years, and with Aaron Loup, who looks tired. Dustin McGowan was placed on the DL again today, though thankfully not with arm trouble (he has a strained side) and he actually looked pretty great in limited work since his return. All in all, the pen hasn’t been the weakness it could have been. We’ll see what we get with Sergio Santos, who is expected to finally return. He could add a big boost to a group that desperately needs some rest. RD: I think they’re a bit better than a ‘C’. Does it stand for anything? PD: Sure. It can stand for consistent. Happy? RD: I guess. I know what’s coming though. PD: Well it had to at some point. Well, at least Gibbons is enjoying himself. PD: Not this time! The starting rotation is my group to eviscerate. R.A. Dickey has continued his inconsistency, mixing excellent starts with absolute duds. Mark Buehrle has been great his past two starts, but who knows how long that’ll continue? He’s a middling starter at this point that’s due 37 million over the next two seasons. Brandon Morrow is still on the DL and could be out for the season- again. Ricky Romero is still in the minors and there’s no sign of J.A. Happ. We haven’t seen Drabek or Hutchison yet, though that’s not necessarily unexpected. Esmil Rogers has fallen off after a great start, a 4.36 ERA in July and two blowouts showing why he began the season in the bullpen. And last but not least, Josh Johnson has been atrocious. A 6’7 power pitcher who can throw 93-94 needs to throw his goddamn fastball! He piddles around, trying to throw perfect breaking pitches and baffle hitters. He needs to throw the ball hard on the black, something he hasn’t been able to do at all this season. This whole rotation has been the Achilles heel for the team this season, constantly putting the lineup behind the 8-ball and over-working the relievers. They get a ‘K’. PD: No! A ‘K’ as in strikeout, in a baseball boxscore. They’ve struck out. They’re done. RD: ‘K’ just reminds me of Kawasaki. PD: Those were the days eh? RD: Yeah. So you’re done now? PD: Yup that’s about it. RD: I have to say, even for you, this grading system was a little deranged. PD: I think it makes more sense than you think. PD: Well take a look at them all together. RD: You didn’t—you were being so nice! PD: Oh I did baby! Let’s see the whole thing! RD: Ok fine. I hate you. PD: See you next month? RD: Jeez. I guess we have to. I feel like I just got Keiser Soze’d. PD: My work here is done! Which would be a shame. It is pretty great. Did you read the whole thing, Ha? If not, you’re guilty of the same kind of lackadaisical effort that personifies this Blue Jays squad! Thanks for reading. Well as I posted that I saw your archives…first day with the new eyes…..
Hey Tim! I assume that’s Tim Columbos? I’ve been writing for the site for just over a year. I always post new articles on facebook when they come out, but like you mentioned, everything is available in the archives. Hope all is well my man!